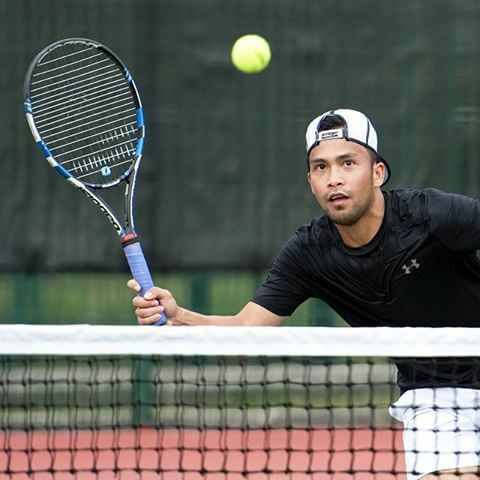 MANILA—After an impressive performance at the first round of the BNP by Paribas Davis Cup first round against Indonesia last month, Francis Casey Alcantara had formally started his campaign towards attaining higher grounds in men’s tennis as he opened his 2018 season with three fruitful runs in Doha, Qatar over the last two weeks. The 25-year-old Alcantara looked solid in his first three tournaments this year after reaching at least each of the elite eight of the men’s doubles events of all the three ITF Futures promotional events at the Khalifa International Tennis & Squash Complex which kicked off last Feb. 26 and will run through Sunday. Alcantara teamed up with Hong Kong native Pak Long Hyeung in the tournament-ending F3 Futures event to reach the quarterfinals before bowing down against eventual tournament winners Fajing Sun of China and Chun Hun Wong of Hong Kong, 7-6(6), 6-4. “It feels good to be back and healthy. I’ll just keep getting better from here,” Alcantara told Dugout Philippines in an online interview. “It’s all the same feeling for me. As long as I can get to play, I’m happy with it right now…it’s to focus on winning in my next tournaments,” he added. Alcantara started his Qatar odyssey with American pro circuit veteran Anderson Reed to reach the semifinal of the F1 Futures highlighted by a thrilling tie-break victory in the first round where they nipped Qatar’s Mousa Shanan Zayed and Mubarak Shannan Zayid, 6-1, 2-6, (10-5), before exiting at the final four against Belgian Zizou Bergs and Hungarian Scott Griekspoor in another stirring tie-break, 6-2, 6-7(5), (10-7). The Filipino-American duo then booked a ticket to the quarterfinals of the F2 Futures event by eliminating the co-unseeded tandem of Issa Shanan Al Harassi and Mubarak Shannan Zayid of Qatar, 6-7(3), 6-2, (10-2) before getting outlasted by Italians Omar Giacalone and Pietro Rondoni, 6-4, 3-6, (10-8). The Philippine Davis Cup veteran will next play in Manama, Bahrain to compete for the Bahrain F1 Futures, which will also two more Filipino netters in Jeson Patrombon and Jan Godfrey Seno, who are both listed in the qualifying draw of the acceptance list, at the Bahrain Tennis Club on March 19-25. Among others who will be joining to fill a Filipino-stacked Bahrain court were Philippine Fed Cup team player Marian Capadocia and Citigreen Tennis Resort homegrown talent Hannah Espinosa. Elsewhere, meanwhile, young Filipino tennis hotshot Iggy Pantino continued engraving success this year as he earned his first ever ITF Juniors Grade 1 finals at the 31st Sarawak Chief Minister’s Cup in Malaysia with partner Beibit Zhukayev of Kazakhstan, only to succumb a 4-6, 4-6 defeat against eventual winners Erik Grevelius of Sweden and Hikaru Shiraishi of Japan.